I am deeply honored to have been selected as a recipient for the SILLC Global Award, and greatly appreciate the continued efforts of the award’s donors to support the fund. With the funds provided, I will be able to travel to Moscow, Russia, through the UA’s Arizona in Russia summer program, enhancing my understanding of Russian language and culture during the eight weeks I spend there. Moscow is considered to be the cultural and political heart of Russia, and the opportunity to travel there personally is a privilege that is not lost on me. As a student in the fields of Political Science and Russian, I’ve spent a great deal of my academic time examining the relationship between the U.S. and Russia. As such, the ongoing need for positive cross-cultural exchange between the two countries has become increasingly clear to me. By traveling to Russia this summer, I hope to be a catalyst for that exchange, and present both the U.S. and the UA in a warm, shining light. Corresponding particularly well with my majors, my journey to Russia will undoubtedly bolster the growth of my character, and reinforce the foundation of my academic success. Once again, I’d like to offer my deepest thanks to the SILLC Global Award donors and selection committee. Without the funds provided, I may not have been able to attend the Arizona in Russia program, and would have missed out on a wonderful opportunity. I will ensure that your investment in my travels does not go to waste. Ethan is majoring in Russian and Political Science at the University of Arizona. I am humbled and honored that the SILLC Committee has supported me by awarding me the 2019 SILLC Global Award. I will be using this to travel to Hangzhou, China in order to continue my studies there in combination with the departments of Religious and East Asian Studies in the College of Humanities and with the Hangzhou Buddhist Culture Project. I will be using my time in Hangzhou to research and contribute to the understanding of the story of modern Buddhism by helping to connect the role of this important location to the overall evolution of Buddhism globally. I will also be partnered with graduate students from the University of Arizona along with students from China to share information and find a way to advance the conversations in this field. It’s really not about a degree or a career for me. My knowledge and experiences resonate beyond me every time I can offer insight to someone in areas that are desperate for understanding. The more I can learn and experience, the better equipped I am to participate in our collective human experience. I am passionate about fostering understanding between cultures and I believe the knowledge obtained by spending time in unfamiliar places is the best way to bridge any divide. I honestly believe that this is the power in the Humanities. Beyond simply learning a skill, these areas of study help us create an understanding. It reminds us that we are not machines. After navigating the complex layers of our history, it helps us re-discover the familiar resonances inside all of us. Those are not idealistic statements of my imagined utopia. My statements are generated by having the opportunity to see and feel these things beyond any source of interference. I have that opportunity because of people like the representatives of the SILLC Committee and I am grateful for their support. Rob is majoring in East Asian Studies and Religious Studies at the University of Arizona. The SILLC Scholarship Committee and donors have aided my dream of pursuing a career in classical philology and I am exceptionally grateful and honored. With this award, I will travel to the beautiful Orvieto, Italy and immerse myself in the cultural center for my intended field of study for graduate school, classical philology. As a Classics major, I find that studying complex and beautiful ancient languages develops my character and improves my ability to reason, problem-solve, and empathize across cultures. While in Orvieto, I will continue to master Latin and Ancient Greek, and I will engage firsthand with the texts, art, and architecture that has played such a significant role in the development of the modern world. My experience of reading and analyzing stunning works of Latin poetry and prose has demonstrated the incredible beauty and power of language, underscored the rich literary heritage of ancient Rome, and inspired me to strive in my pursuit of the classics. The opportunity to be a part of the very landscape of Italy that figures so prominently in the works that inspire me, to read inscriptions and graffiti in situ, and to engage in the study of health and medicine in classical antiquity will bring me further closer to ancient culture and inspire my Honors thesis. In Orvieto, I will experience new things and build new friendships that will propel me toward success in graduate school. The opportunity to immerse myself in the history and culture of Italy and witness firsthand the material remains of its past will unveil a new world to me and enrich my cultural cognizance, and I would not have ever had this opportunity if it were not for the SILLC Scholarship Committee—thank you SILLC Scholarship Committee and donors! Arica is majoring in Classics at the University of Arizona. Receiving this prestigious award is a great honor, and I am both appreciative and humbled by being named a 2019 recipient. I am incredibly grateful to the SILLC Scholarship Committee and to all of the generous donors who have contributed to the SILLC Global Award Fund and I am honored to be representing the University of Arizona, the College of Humanities, and the School of International Languages, Literatures, and Cultures. I will be studying abroad in Germany for the entire 2019-2020 academic school year through the Verband der Deutsch-Amerikanischen Clubs (Federation of German-American Clubs) Student Exchange Program, and it would not be possible without the generous support from SILLC and all of the donors. Speaking German has been an aspect of my identity since I was six years old, when I moved to Germany as an American expat, and I feel so blessed to be able to continue my studies in the language academically and to be able to spend a year there, being fully immersed yet again. I truly believe that immersing yourself into another culture is one of the best ways to grow as an individual, and without the opportunity provided by the University of Arizona and the financial support from SILLC and the donors, I would not be able to study abroad for an entire academic year. This program will propel me in my academic studies and personal goals, and I am beyond excited. Please accept my sincerest gratitude for affording me this once in a lifetime opportunity. Vielen Dank! Alexandra is majoring in German Studies and Biological Antrhopology at the University of Arizona. I am truly grateful for the opportunity that the SILLC Scholarship Committee is providing me. This scholarship will allow me to attend the Arizona in Paris trip this summer and build upon my double major. Studying French has allowed me to become a versatile student, strengthening who I am as a human being and expanding my global awareness, and with this trip I wish to continue to grow. I hope to also create a strong foundation for my professional goals, by studying the health care system of France in hopes to find inspiration for my senior thesis, tying together my academic and professional goals of studying medicine with the goal to aid the global health community. Being able to immerse myself in the French culture and language has always been a dream of mine, and now that dream is coming to fruition with the aid of the SILLC Global Award. I cannot wait to spend the summer speaking French and living in this beautiful culture! The SILLC Committee has my utmost appreciation and gratitude, for without their generosity I would not be able to pursue my academic and professional dreams. Madeline Morrow is majoring in French and Biochemistry at the University of Arizona. I am extremely grateful to the SILLC Scholarship committee and all of the donors involved for this generous award. This scholarship will ensure that I fulfill my dreams to study abroad and further both of my career options and my knowledge of studying in foreign countries. By allowing me to explore my academic interests by participating in the program, Arizona in Italy, the committee has partially relieved the financial burden of studying abroad, an obstacle many students are not able to overcome. This summer, I will be heading to Orvieto, Italy to study Roman literature and religions. This program is a very popular choice for students and has subsequently established an excellent reputation among both UA students and the locals in Orvieto. By studying abroad, I hope to not only further my own major studies, but also get to know students from a variety of backgrounds. This study abroad program will help me complete the my major in Classics as I am currently pursuing a BS in Chemistry and a BA in Classics with an emphasis in Classical Civilizations. Thank you again to all the wonderful donors and members of the SILLC Scholarship program and I hope to make your efforts worthwhile. Sujin Seo is majoring in Classics and Chemistry at the University of Arizona. Receiving this generous scholarship is a great honor. It means so much to me to be able to represent the School of International Languages, Literatures, and Cultures as well as the East Asian Studies Department this summer. For the month of July I will be studying abroad through Arizona in HangZhou, spending four weeks with my U of A peers at the Chinese Academy of Art. During this study abroad experience I will have the opportunity to practice and develop my Mandarin skills, a language I have been studying for seven years and am pursuing at the U of A as an East Asian Studies Major. Additionally, the program enables me to take courses on Chinese culture in the historical and traditional city of HangZhou, an experience which will strengthen my knowledge of Chinese language and culture for many years to come. I would not have been able to attend Arizona in HangZhou without this scholarship – thank you to the donors and sponsors of the SILLC Global Fund. Grace Faerber is majoring in East Asian Studies and Global Studies at the University of Arizona. Being a 2017 recipient of the SILLC Global Award is a great honor. This prestigious award has provided many students the capability to explore their academic interests and personal travel dreams in the unique setting of study abroad, and I am more than thrilled to be joining their ranks. This summer, I will be traveling with Arizona in Bhutan: Spiritual Ecology and Himalayan Buddhism to the Land of the Thunder Dragon, the Kingdom of Bhutan. 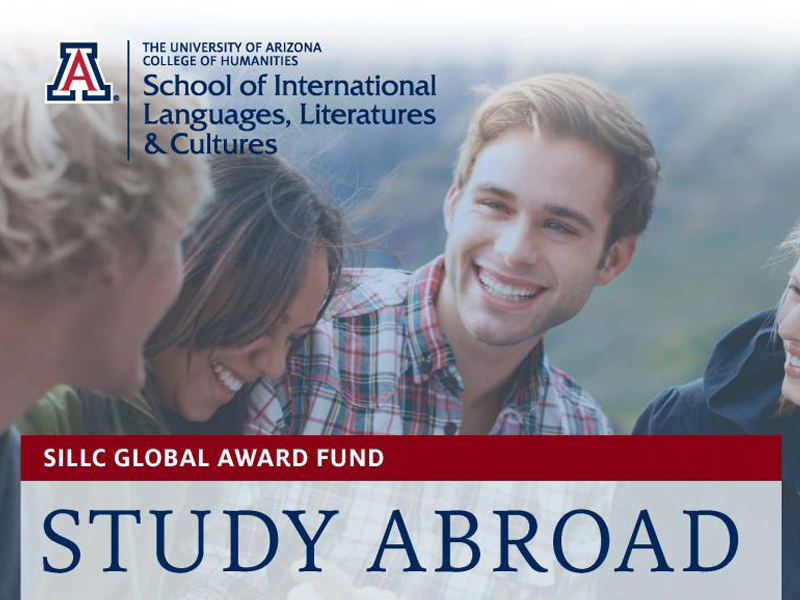 This study abroad program is an incredibly rare opportunity, and one I would not have experienced within my lifetime without the University of Arizona study abroad programs and the financial assistance provided by the generous donors of the SILLC Global Award. Please accept my most sincere appreciation and gratitude for affording me this opportunity. It is my great desire to one day become a full member of the global community, and taking part in this trip marks the first step towards achieving that goal. The opportunity to learn outside of the classroom setting, fully immersed within a culture and environment unfamiliar to our own, is how I believe we grow as both scholars and individuals. Being a recipient of this travel award means that these life-altering opportunities are accessible and worth pursuing. Chelsea Elizabeth Forer is majoring in Religious Studies and Biological Anthropology at the University of Arizona. I am incredibly indebted to the SILLC Scholarship committee and all the donors involved in deciding to give me this wonderful award. As with the other recipients of this award, I am incredibly grateful for all the support these donors have decided to offer to students who wish to study abroad in other nations and their efforts to further both students’ career options and knowledge of nations besides our own. I hope to make full use of the opportunity now provided to me when I begin my study abroad next semester. My intended study abroad location is in Tokyo, Japan and I will be studying at Tokyo International University. This university is a very popular choice for international students from a variety of nations including the United States and China. When I study abroad here, I hope to not only further my own major studies, but also get to know students from a variety of countries. This study abroad program will help me complete the second half of my double major as I am currently majoring in Economics and East Asian Studies (Japanese Language Intensive). Thank you again to all the wonderful donors and members of the SILLC Scholarship program and I hope to make your efforts worthwhile next semester. Daniel Fitzsimmons is majoring in East Asian Studies and Economics at the University of Arizona. First and foremost, I would like to thank the SILLC Committee and donors for making this scholarship, and my dream of studying abroad, a reality. The generous committee has made my summer trip to Paris through the Arizona in Paris program possible. I am looking forward to fully immersing myself in both the culture and the langue through the homestay and classes taught abroad. Through this program, I will be not only fulfilling a lifelong goal, but both of my majors – French and Art History. Pursing a Ph.D. in Art History, and French art in particular, has been a long-term professional goal of mine. This requires fluency in a language and original research which are what I will be working on abroad. I can’t express how excited I am to visit world famous museums, a historic city, and improve my fluency in a language that I love. I am entirely grateful to grow both professionally and personally while experiencing French culture and all that is has to offer through the generosity of the SILLC Committee and donors. Merci beaucoup! Jennifer Marine is majoring in French and Art History at the University of Arizona. The SILLC Committee has my utmost gratitude for awarding me with this tremendous opportunity. To all the donors, thank you for helping this scholarship thrive and supporting students, like myself, to study abroad and immerse themselves in their passions. Thanks to this award I will be traveling to India through the UA Study Abroad Program Arizona in India: Religion and Life in Mysore during the Summer of 2016. I will be traveling to southern regions in India around Mysore taking upper division research courses where I will be learning how to conduct religious studies fieldwork and do research of my own. This will help me in preparation for graduate work and graduate school focused on neuropsychology and religion. I am very excited to be going abroad! Before I even filled out my college applications I knew I wanted to study abroad and now I have the opportunity. This trip will help to show me different religions outside of a classroom in an entirely different culture. In my pursuit of graduate school in Clinical Psychology I was told that before telling someone how to live their life, you have to live your own. I am going to do just that! Thank you! I am extremely grateful to the awarding committee and gracious donors of the the SILLC global award fund. Thanks to this scholarship, I am able to spend the entire summer of 2016 in Moscow, Russia, with an excursion in St. Petersburg. While in Russia I will be gaining important language and cultural experience which is not only critical for my major in Russian, but also will enrich my life as a whole. I will be studying in an intensive language program called GRINT at Moscow Humanities University. This experience will be greatly beneficial to my education and future, and I am very excited to begin this adventure. Thank you again to everyone involved in the SILLC global award for making this dream a reality of mine. This summer, I will be studying for five weeks at the University of Antilles in Fort-de-France, Martinique. Thanks to the generosity of the SILLC Global Award Fund, I will be working towards my major in Political Science: Foreign Affairs, as I learn about Caribbean culture, literature, and politics. In addition, I will be staying with a local family in order work towards my double major in French, and improve my language proficiency with native speakers. I look forward to immersing myself in an entirely new culture, with the opportunity to work towards both of my majors simultaneously. In between classes and time spent with my host family, I will be going on excursions to historical sites and relaxing on paradisiac beaches. I feel so grateful for this experience, as it will enable me to pursue my goal of working for an international organization like the United Nations which requires both foreign experience and fluency in multiple languages. I am honored to have been chosen for this award, and I would again like to thank the donors of this scholarship for ensuring my future success. Merci beaucoup! This next academic school year I will be studying Linguistics at Leipzig University in Germany. I wish to thank the generous donors of the SILLC Global Award Fund, as well as the award committee, for making this possible. With your support, I will be spending an entire year mastering my German and studying Linguistics at an incredible university known for its history, linguistics program, and connection to the Max Planck Institutes. Not only will this experience be crucial to my German Studies and Linguistics double major, but it will help prepare me for my graduate studies at a German university. Thank you for supporting not only my year abroad, but for helping me along my professional and academic path. I am honored to have been chosen for this award and hope to one day be able to return the favor by supporting other young people in their academic pursuits abroad. Thank you! I am extremely thankful to everyone in the SILLC Committee for awarding me my very first (hopefully of more to come) study abroad scholarship. Thanks to this generous contribution to my academic career, I will be studying abroad in Kobe, Japan for the 2015-16 academic year. While there I will be taking intensive Japanese language courses, as well as culture-focused courses that will enhance my knowledge about the beauties of Japanese literature, history, and tradition. The program I will be a part of contains numerous excursions to historical sites around Japan, including shrines and temples in Kyoto and Nara. What I am most excited about is the chance to really immerse myself in the life of a Japanese student, by having the opportunity of a home-stay experience for the entirety of the year. After studying abroad I will take one more class in Japanese, and be done with my EAS major. I plan to stay another two years to complete my English and Global Studies major, and hopefully graduate with honors. I have a lot of plans for the future, among which are applying for a Fulbright grant, work as a Foreign Service Officer abroad in Japan, and/or teach English in Japan and other countries. Studying abroad is a critical step to achieving some of these goals, and I am beyond ecstatic to be able to go without fearing greater financial burden, thanks to this scholarship. Thanks to the generosity of everyone in the SILLC committee, I will be spending my 2014 summer session in Paris, France and Dakar, Senegal. The program divides in to two 4-week sessions in each location. While in Paris, I will be studying not only the French language but also Francophone cultures through literature and film. Then, during my stay in Dakar, I will be studying African society through contemporary literature as well as taking a course in the Wolof language. I am very thankful for this award as it will help me towards my goal in improving my French and slowly complete my major in French. I hope that this award not only allows me to improve in language, but also help me to immerse myself in the cultures that I will be with over the course of my summer study. I am very excited for this opportunity and I thank again everyone who forms part of the SILLC Award. Thank you. Thanks to the generous donations of the SILLC committee, I will be spending my Fall 2013 semester studying French in Montpellier, France. This program combines a pre-stage session, with excursions around Southern France with international students and a French language refresher course, followed by a semester exchange program. While there, I will take both RI courses with international students and integrated courses within Paul-Valery Montpellier 3 in French linguistics, phonetics, and culture in an effort to improve my spoken and written French to native fluency. I am very gracious to the award committee for this opportunity, as this abroad experience will build on my current French foundation and allow me to take many courses towards completion of the major. Additionally, as a triple-major in French, Psychology, and Philosophy, I hope to use this experience to connect with a French professor to sponsor me on a Fulbright Fellowship that I plan to apply for upon graduation. This experience is integral to my on-going educational experience and I am honored to be a recipient and am looking forward to this opportunity! In June 2013, I will have the opportunity to study abroad for five weeks in Leipzig, Germany thanks to the SILLC Global Award. While in Germany, I will take a course centering on daily meetings, conversation, reading, and writing in the German language. It will be my first time abroad, and I look forward to experiencing the culture and language immersion. The program also includes weekend excursions to surrounding cities for local events. I hope this trip allows me to expand my knowledge of the German people and leads to further traveling abroad. Thanks to the generosity of the SILLC Global Award, I was able to study abroad in Lebanon during the summer of 2012. During my time in Lebanon I participated in Lebanese American University’s Summer Institute for Intensive Arabic Language and Culture in Beirut, Lebanon. I also studied at the University of Balamand in North Lebanon where I further developed my Arabic skills. Throughout my time I also had the opportunity to visit many attractions including the Jeita Grotto and the Roman Ruins at Baalbek. All thanks to the SILLC Global Fund Award, I am currently studying in Orvieto, Italy, a small town in the Umbria region. It is the most beautiful place I have ever been. Here, I am enrolled in credits towards both of my majors - psychology and Italian. I am also involved in an Italian internship, which allows me to tie my two (very different) passions together, by studying and comparing family interactions in both Italian and American families by speaking with the local Italians. With this program, led by UA, we have the incredible opportunity to take biweekly excursions to various historical and archaeological sites within Italy. The history of Italy and Europe is truly inspiring. I also recently returned from a trip to Greece and Turkey - another great advantage of studying in Europe! I hope to grow and learn much more in my remaining time studying abroad in Italy, and am excited to share what I have learned with my fellow students upon my return to the UA! Thank you for everything - I am very grateful!